Projects and product development efforts ideally start with a vision associated with a business need or direction. This vision is then typically framed in context of a strategy and associated goals and objectives during a management team planning session. Strategy is the creation of a unique and valuable position, involving a different set of activities and it involves making choices throughout the value chain that are interdependent. Agile strategy can be represented in a strategy curve (S-curve). It depicts how a product, service, technology or business progresses and evolves over time. S-curves can be viewed on an incremental level to map product evolutions and opportunities, or on a macro scale to describe the evolution of businesses and industries.On a product, service, or technology level, S-curves are usually connected to “market adoption” since the beginning of a curve relates to the birth of a new market opportunity, while the end of the curve represents the death, or obsolescence of the product, service, or technology in the market. Usually the end of one S-curve marks the transformation to a new S-curve – the one that displaces it. You may review Agile Strategy Manifesto for more details. 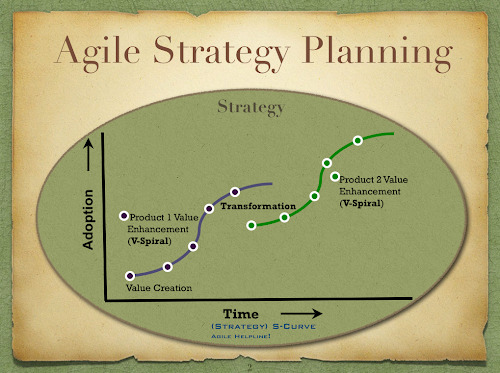 Agile strategy planning is the top most layer of Agile Planning Onion. You can review the next planning layer by clicking on the following diagram. I recommend to watch this video to get a better understanding of linkage between all layers.